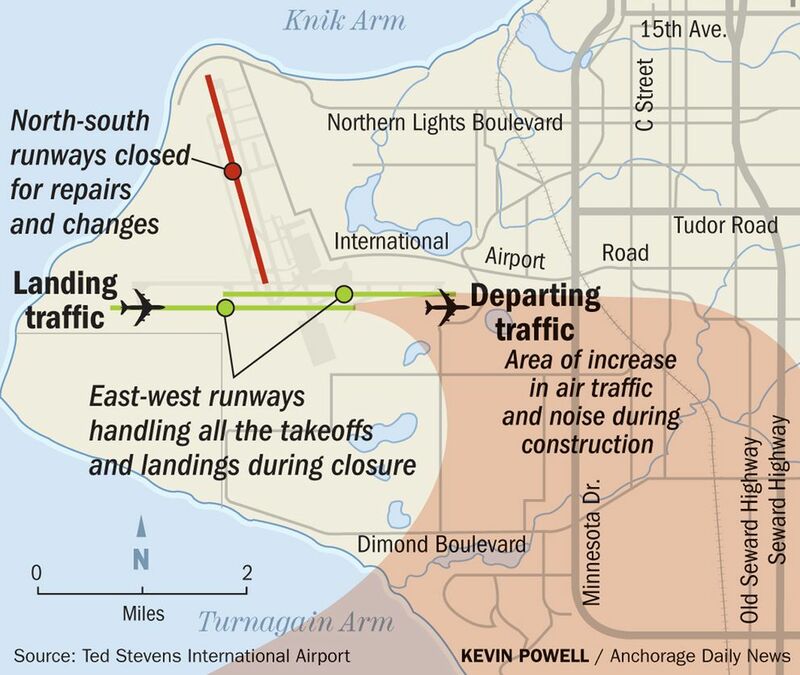 Jet noise over Anchorage will soon return as Ted Stevens Anchorage International Airport gets the second and final year of its runway renewal project underway. The airport’s north-south runway will be closed for repairs starting Monday. As a result, the airport will have to use its east-west runways for all flights. Most arrivals will come in over the water to the west of Anchorage, but most departures will take off to the east, over the city. That means more noise in the city from jets that normally take off over water. The jet noise this year will last longer than it did in 2018, when the runway closure ran from June to September. Work this year is set to last until October. “We as the airport are going to do our best to mitigate the noise,” said airport manager Jim Szczesniak. That will involve working with airlines on noise abatement procedures, including pilots pulling back on throttles when they are over the city, then going back to full power once they’re at a higher altitude, he said. The last time the runway was redone was 16 years ago, Szczesniak said, and it needs pavement repairs and electrical work. The project will also involve widening the runway to accommodate larger aircraft. Work last year frustrated some Anchorage residents, keeping them up at night or rattling windows. About 20 percent of the project was done last summer, and the other 80 percent of the work is set to be finished this year. Crews will work on the runway 24/7, Szczesniak said. You can read more about the project on the state’s website. For some in Anchorage, 2018 brought the summer of airplane noise. But just wait until 2019.